The Second Step to get into & start your own Note Business! Complete live recording of Jeff’s SOP 201 workshop with workbook materials available online through video and PDF downloads. Download link emailed after purchase. …IS FINALLY HERE! The most current, up to date, in-depth, detailed, information packed Note Business home study course in the industry is NOW ready for delivery! Using my experience of over 1500 closed individual seller financed note transactions to date, the knowledge I have gained working the business since 1991 as a note broker and note investor AND as a current practitioner in the note business I have left no stone unturned, no question unanswered and no topic uncovered to share with you the inner workings and practical knowledge of the true seller financed note business. This is an Advanced Beginner’s continuation to the Secrets of Paper 101. The recording of a live 3-day action-oriented workshop concentrating on Marketing for notes, Beginning Calculator Skills and Negotiating. 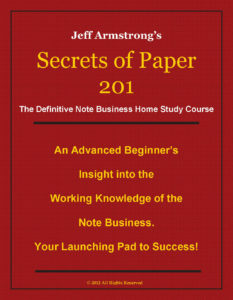 In the Secrets of Paper 201 home study course we expand on the note business process of how to Find them (the note holders), Expose them, Educate them and Support them to earn your F.E.E.S. We further break down the components of the seven basic steps (Basic Marketing, Gathering Information, Submit for Pricing, Obtain Offers, Subtracting Your Fee, Presenting the Options and Following up) into practical and effective solutions so that you have a hands on workable knowledge of the note business. Once you learn the process and follow the steps correctly you will earn your F.E.E.S. and be able to repeat the process again and again! In 2011 the fewest number of seller financed notes in any state was 52 in Washington DC. In 2011 the most number of seller financed notes in any state was approximately 20,728 in Texas. At an average note amount of $50,000 multiplied by the 87,684 notes in 2011 equals $4,384,200,000.00!!!! Yes, that’s over $4 Billon worth of new seller financed notes per year across the country waiting for us to find them and make them offers! Not to mention all of the pre-existing notes already out there for us to go after. As you can see from the figures above it seems we have finally passed the bottom of the wave in the note business and there is no place to go except up! I will also disclose to you here that by doing what I share in the Secrets of Paper 201 Home Study Course this year the responses to my personal marketing have gone up, my acceptance rate has gone up and the number of transactions closed this year versus last year has gone up as well! If you have been dabbling in the note business but never learned the exact details; if you’ve been waiting on the sidelines trying to “time” the seller financed note market; if you’ve heard a thing or two about the Note Business and wondered how it really works; if you’ve dipped your toes in the note business, read a book or two OR learned about the business and then were left hanging; well… then this is for you. Without question, the Secrets of Paper 201 Home Study Course is the definitive note course for the Seller-Financed Note Business, hands down. You may have tried a thing or two but you have not spent the time to completely test it for yourself. I’ve done the testing and I have the results. Learn what works TODAY! 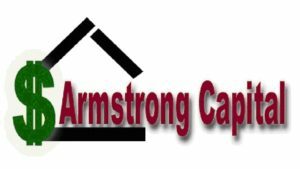 Real practical up to date actual detailed marketing and negotiating methods that myself and other current successful note brokers and buyers are using today. Not sure if the Secrets of Paper 201 Home Study Course is for you? This course is for people who want to take the next step and get into the seller financed note business, people who are just starting out in the business, people who have been dabbling in the business for a little while but now want to get serious, people who were in the business in the past but want to get back into it now or who are experienced note brokers and buyers that want to learn the latest marketing methods that are working in the true note market. It is also for real estate agents, real estate brokers and mortgage professionals who are not doing as well as they were a couple years ago, who want to add something to their business to keep the cash flow coming in and who want to learn how seller financed notes can help them sell more properties in the current market. If you have any questions or you are on the fence wondering if the Secrets of Paper 201 Home Study Course is for you, please email me or give me a call at 800-845-3055. Secrets of Paper 201 is YOUR launching pad to becoming a knowledgeable and sought after note broker. In-Depth Working Knowledge – At last, a workshop that you can be proud to tell your associates, colleagues and investors about! You will come out of it with a marketing plan and the steps to move forward with your note business! You will retain required knowledge and obtain calculator proficiency. The strategies and methods in this home study course been developed and refined over countless years of practice, implementation, experimentation and execution. You will not complete this course and have pie-in-the-sky ideas and unachievable dreams but rather a structured path to achieving success as a Note Broker in the exciting and rewarding business niche of the Seller-Financed Note Industry. Have you ever wished you could be sitting at, or very near, the top of a successful note business? In my 21+ years of trial and tribulation and the school of hard knocks I have dialed in my note business to an exact science! It’s not that hard, anyone can do it if you just follow the steps, be persistently and commit to being successful! “You have brains in your head. You have feet in your shoes. This is your chance to improve and lock in your note business skills without having the added expense of traveling or attending a live class or workshop. The Secrets of Paper 201 Home Study Course is for you to learn at your leisure yet gives you the support you need after you have completed the course to keep you on the path to success. The Secrets of Paper 201 Home Study Course is NOW ready for immediate delivery. PLEASE DO NOT DELAY! DO IT RIGHT NOW! ORDER TODAY!